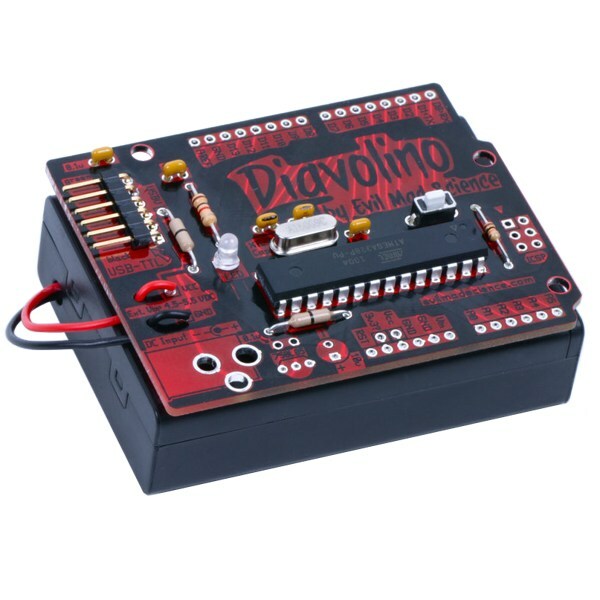 The Diavolino Kit from Evil Mad Science includes a battery pack and headers so you can build a handy brain for your robot projects. This kit is for the DIY Do It Yourselfers out there who love to solder their project boards. Despite the fact that Diavolino is Italian for "little devil", this is not a difficult kit to build at all. In fact, it has been designed using through-hole parts so that only basic soldering skills are required. This microcontroller features the popular ATmega328p which comes preprogrammed with the Arduino bootloader. You will need an FTDI USB to TTL Serial cable or adapter to upload your Arduino sketches to this board. The Diavolino is a bare bones Arduino electronic kit that is suitable for a variety of projects. This kit includes a 3 AA battery holder with switch and the headers needed to attach Arduino compatible shields. Please note that not all shields will work with the unregulated battery power. Also, this board does not provide the 3.3V available on some Arduino boards. This board is ideal for folks who enjoy soldering and want a handy self-contained Arduino microcontroller.